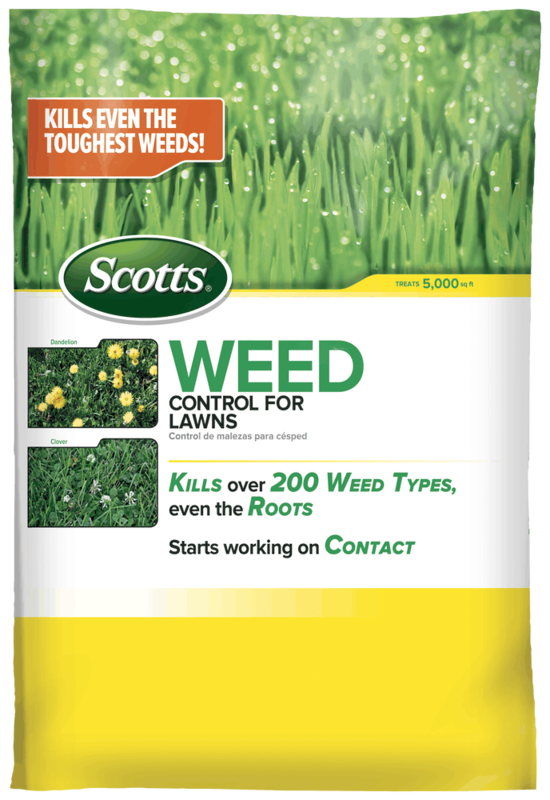 Scotts® Weed Control for Lawns is a granular weed control solution designed to kill weeds without harming your lawn. Leveraging Scotts weed killing technology, Scotts Weed Control for Lawns starts working on contact, and kills down to the root! Backed by the Scotts No-Quibble guarantee, Scotts Weed Control for Lawns kills over 200 types of weeds, including the toughest weeds like dandelion and clover. Keep your lawn weed free with Scotts Weed Control for Lawns. Use Scotts Spreader to apply product to dry lawn or slightly moist lawn. One bag covers 5,000 sq. ft.
Do not use on St. Augustine, dichondra, carpetgrass, or bentgrass. Do not apply near waterways. 200 types of weeds including Dandelions and Clover (a full list can be found on the back of the bag). Scotts products are designed with care for the lawn. A healthy lawn cleans the air, produces oxygen and prevents runoff and soil erosion. You can make a difference- help keep our water resources clean. Apply this product only to your lawn and sweep any product that lands in the driveway, sidewalk or street back on to your lawn. Do not apply product by hand. Do not apply when over 90 degrees. Do not apply on windy day. Affected weeds in treated area will stop growing and gradually die after application. Kills dandelions and other major lawn weeds. Protects and strengthens for a better spring lawn. Fertilizer plus iron for extreme greening - guaranteed.